Wow, we’re still trying to wrap our heads around the oustanding talent displayed at Essence of Bellydance 5. This was perhaps one of the most intricate and layered conferences we’ve partnerned with to date. There are a lot of people involved behind the scenes of this festival. They volunteer their time, energy and resources to make it spectacular. Being behind the scenes allowed our MBD team a glimpse into what it takes to truly celebrate Raqs Sharqi in a respectful way that makes people want to come back again and again not just to this art but to this particular extravaganza. First off, dance fans are already signing up for next year’s EOB…like right now! There’s an early bird special – all inclusive weekend available. The comments and reactions from fans have been very positive and the team was already planning 2016 just as 2015 got off the ground. They are a super group of dedicated show hosts in that they don’t let anything fall out of place. They really go the extra mile not only checking in with the fans, attendees and of course, the well-pampered stars but also with each other. Faaridah has a true sisterhood of support behind her that helps create something so outstanding you just have to be there to see it! Watch this space for 2016 details. 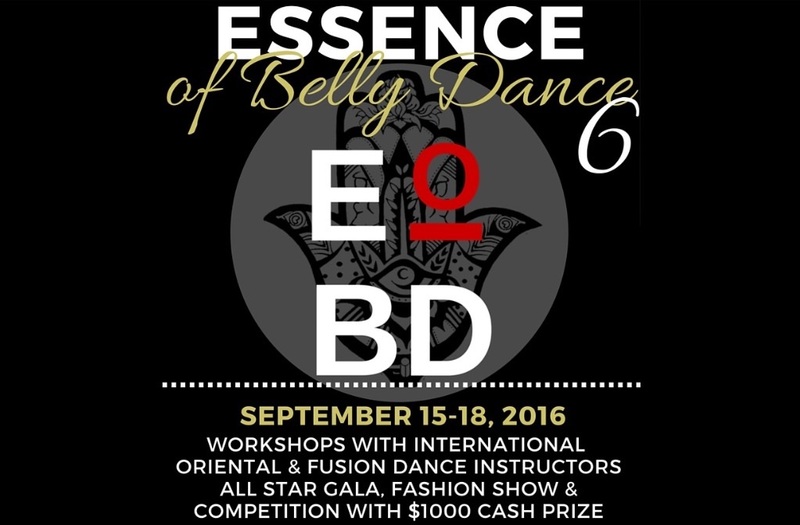 This year MissBellydance was a major sponsor of the EOB bellydance competition. We requested our friend and archivist Andinha to be on the ground and make sure the winners received gift bags featuring gift cards, merchandise and little extras from our team. We want to thank all of the amazing stars like, Aziza Nawal, Petite Jamila, Issam Houshan and Sorraiah Zaied to name a few, who worked hard to make sure everything was conducted fairly. This was very difficult for us as a company to be limited to “rewarding only a few.” We feel that raqs sharqi is an inclusive past time, a passionate ceremony so to speak where souls mesh on the dance floor together. The idea of “who is the best” is not our philosophy. However, we can get behind the idea of celebrating those who take it to the next level and that’s exactly what the top 3 winners did in each category. An extended Shukran Jazillan to Lady Zaied also cheered us on in the fashion show and was enamored with our raqs lifestyle wear. Her reaction to the pink outfit shown above was priceless! We’ve got your outfit Sorraiah. It’s being custom made just for you! We love and appreciate your legacy and your work past, present and future. Big thanks to our models who really wore MBD well. Items were quickly requested for purchase in the hours following the show. We appreciate your hard work and time spent promoting the brand. Continued thanks to Faaridah and Team Essence for taking such good care of raqs in Atlanta by hosting an event that was enjoyed by so many fans and lovers of the art of Bellydancce. This conference featured not just international stars but a myriad of dance teams from Atlanta working together to make the city shine like the sun. You all take care of your stars and you go out of your way to make events positive and memorable, this is not easy feat. Mabrook to each of you and shukran! *Special thanks to Studio Jaki for her outstanding talent and quick turn around with the photography. There are no words to describe how incredible her dedication is to this industry. Jaki, you are more than appreciated! Miss Belly Dance is the official sponsor of the first ever Essence of Belly Dance 5 Competition! 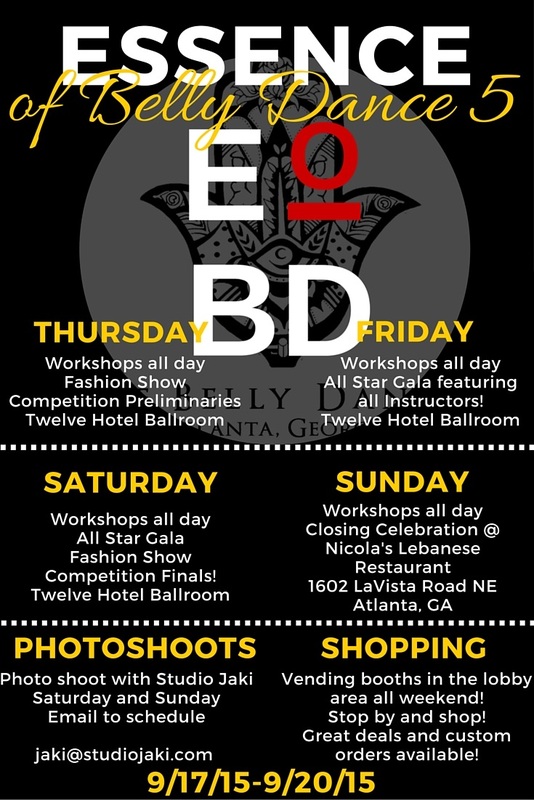 Join us at the Twelve Hotel Atlantic Station Thursday 9/17/15-Sunday 9/20/15 for workshops, gala, fashion show and competition! Workshops with International Belly Dance Instructors, both Cabaret/Oriental and Tribal Fusion! From the U.S.: Jill Parker, Kami Liddle, Tjarda, Petite Jamilla, King of the Drum Issam Houshan and Atlanta Star, Aziza Nawal plus Egyptian Mega Stars, Luna of Cairo, Soraya Zayed and Leila Farid! Over 60 hours of workshops!